My younger daughter has already stated that I’m preoccupied with this blog and have been ignoring her, my older daughter wants in on the action and hopes to get a guest writer’s spot one week, and my husband – well, he just had the day off. So I figured, why not include the whole family in this week’s adventure? Since we were spending the long July 4th weekend in NYC, I thought about getting out and doing something “quintessential NY”. 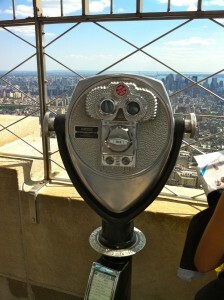 And so cliche, I know, but I had never been to the top of the Empire State Building. Such an iconic landmark right in my backyard and I had never ventured there. Technically, I guess I had been there – but that’s like saying I’ve been to Dallas when I merely spent the night at the airport once during a delayed flight long ago. A while back, I went to pick up a package from my brother-in-law when he worked in the Empire State Building on the 35th floor. And 23 years ago, I remember taking my friend, visiting from Denmark, to the entrance. I left him and his buddies at the front door, told him I’d be back in two hours, and went shopping at Macy’s. The family was game, so we purchased our tickets online. I tried not to dwell on the fact that I was spending money to ride an elevator when I live in a high rise building and use one several times a day. We took the bus down Lexington Avenue, grabbed a slice of pizza on 34th Street and walked over to 5th Avenue. Trying not to let my impatient husband take over “my” day, and ignoring the bickering that was bubbling up between my daughters, I took a deep breath and walked a few steps ahead. “Just enjoy”, I mumbled to myself. The larger-than-life icon stood before us. I wondered why I had never come here. I’m a New Yorker! What gives? The views from the 86th floor were magnificent, the architecture and art deco touches remarkable. But the best part was talking with all of the tourists, listening to them, watching them – the older, Swedish couple with cameras around their necks and Tevas on their feet, the woman from Colorado handing out quarters for the viewfinders on the observation deck. It was so nice seeing New York through their eyes. My family and I sort of felt like the only locals there. For one, we were only a handful of people who had purchased our tickets in advance – New Yorkers definitely don’t like to wait in lines! We soon became unofficial tour guides and happily answered questions of some visitors around us. While those all around reveled in the beautiful vistas, marble details, and city landmarks, my daughters and I delighted in looking for “our” landmarks – their squat blue school, our tall, thin apartment building, my husband’s downtown office – quite a different perspective and an altogether different experience than I anticipated. There was pleasure and pride in the familiarity of it all. Who would have thought? And then it struck me – although not for everyone, I consider myself pretty lucky to live in NYC. Beautiful buildings surround me every day and the views from my apartment are spectacular. The sights and scenes of the landscape around me was what made the day. Our outing ended with a great walk through Madison Park, an awesome Mojito and an even better BBQ dinner at a great restaurant nearby, good photo ops, and more than a few laughs with my family. Week two accomplished! So glad we didn’t just walk over to Carl Schurz Park (our local playground), see the latest movie down the block on 86th Street, or just sit around the apartment. It would have been so easy to do on this steamy July day. I could have even just enjoyed the view from my balcony on the 25th floor! But that’s not the point. Getting out there is – and I was so glad I did. Sounds like a perfect day!! I have never been either (but pass by it almost every day..) – its now on my list! !